In February 2014, we started to work on the Traffic Snake Game Network. 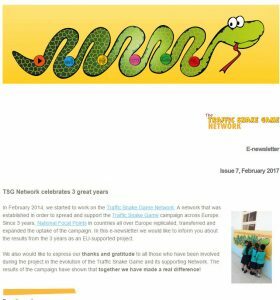 A network that was established in order to spread and support the Traffic Snake Game campaign across Europe. Since 3 years, National Focal Points in countries all over Europe replicated, transferred and expanded the uptake of the campaign. In our latest e-newsletter we would like to inform you about the results from the 3 years as an EU-supported project. We also would like to express our thanks and gratitude to all those who have been involved during the project in the evolution of the Traffic Snake Game and its supporting Network. The results of the campaign have shown that together we have made a real difference!